Before we get to the review, a little story about the release of the game and how I got my copy. If you just want the review, skip to The Review section below. Vinhos was supposed to be released at Essen 2010. Unfortunately, it didn’t make it. The German manufacturer, Scheer, dropped the ball and didn’t get the games printed in time. This was a big blow to both the designer, Vital Lacerda, and the publisher, What’s Your Game?, Vinhos was very much anticipated by the gaming community and having the game miss the biggest convention of the year must have been tough. This was Lacerda’s first game and I can imagine the delay was heartbreaking. However, What’s Your Game? rose to the occasion and, even though it must have cost them dearly, made an offer to ship any games ordered at Essen for free. Now that’s a game company! They ended up showing some early production copies at Essen and one of those copies found its way to Derk and Aldie so it could be played at BGG.con. It was brought to the convention and set up in the hot games room (where the new Essen games are featured). Here’s where I enter the story. In years past, I’ve played the role of teacher in the hot games room. I’ve learned as many of the new games as I could and then spent much of the convention doing the teaching thing. For this BGG.con I reprised my role and learned as many of the new games as I could. Fortunately, I was able to play quite a few of them, courtesy of friends who had brought them back from Germany. Unfortunately, with Vinhos missing the Essen, I wasn’t able to play the game. Since I couldn’t play it, I downloaded and printed the rules, along with the rules of some other games. On the flight to BGG.con, I went through a few of them before picking up Vinhos. I opened it, saw sixteen pages of densely packed rules, pled rules fatigue, and put it away. In hindsight, I wish I had persevered. At the convention, I saw the game being played. It looked great and was getting very good buzz, but I never actually got a chance to play it. About halfway through the convention I was in the staff room and witnessed Derk opening a package they had just received. It was a box of Vinhos, finally printed, fresh from the publisher. He took one out of the box and handed it to me, thanking me for helping with the convention. My pleasure! I walked out of the staff room with the game under my arm only to be endlessly accosted by gamers wondering a) where the hell I got a copy of the game and b) would I be willing to sell it to them for, say, their first born? I decided to keep it, and I’m very happy that I did. 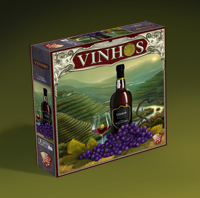 Vinhos is a game about winemaking in Portugal (the word vinhos means wine in Portuguese). First off, this is not a simple game and it is not short. This is a real gamer game and you should expect to set aside at least three hours for a four player game. This is a Die Macher level game – it is not for the faint of heart. The rules, though voluminous, are excellent. Rules writing is a not an easy thing on the best of days, and writing rules for complex games is even harder. I found the rules to be very straightforward, well laid out, and with lots of examples. Whoever wrote these rules deserves at least a nomination for the Essener Feder (the Essen Feather, a award given by the Deutscher Spiele Preis for well-written rules). The graphic design, also, is excellent. The graphic design can go a long way to make a game comprehensible, and in Vinhos it’s executed beautifully. The components and the art are also top-notch. So what’s the gameplay like? Well, it’s on the complicated side, so I’m just going to give you a quick snapshot from 35,000 feet. 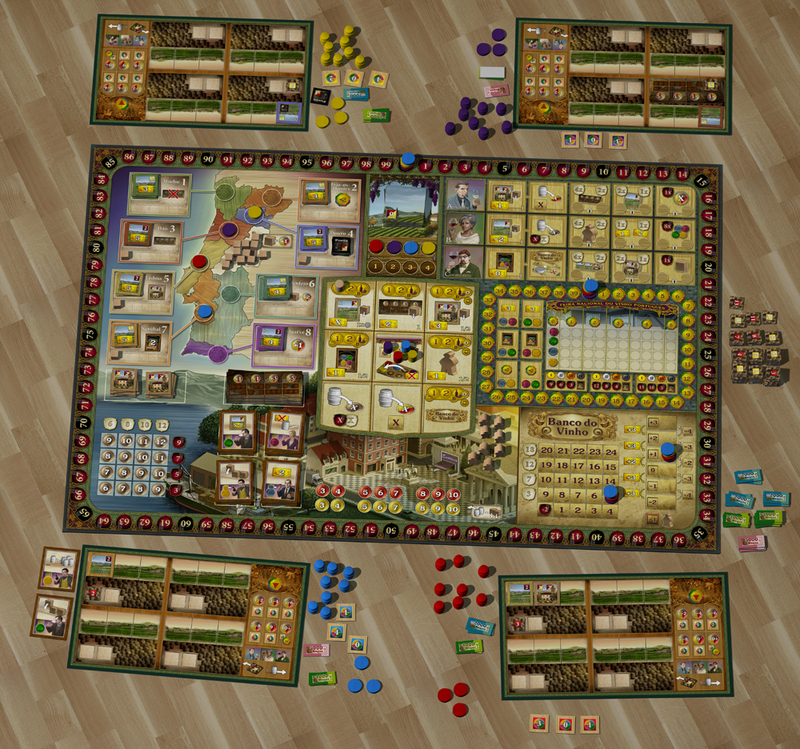 Each player plays a wine producer with four estates. You can fill these estates with various vineyards, producing red or white wines of different vintages. You can add wineries to your estates, or wine cellars, or other things to increase the value of your wines. Each round, which is a year in game terms, you will produce wine from these vineyards and use these wines to sell to local hangouts, export to foreign markets, or show at a wine fair, which happens three times in the game. These actions can get you money (to buy things) or they can get you victory points. Actions are taken via a square rondel-like mechanism – let’s call it a squaredel – that’s in the middle of the board. There are nine different actions but some will cost you more depending on your position on the squaredel. The actions involve getting vineyards, wineries, wine cellars, etc, for your estates. They also allow you to do things like selling your wine, exporting it, etc. After six rounds, whoever has the most victory points wins. That all sounds nice, but does it add up to a game? Yes, it does, my friend, and an excellent one at that. The mechanisms are very nicely interwoven and work very well. As the player actions are fairly quick, the game moves at a decent pace (save for analysis-prone players). And there are many routes to victory. After I had played it two or three times I was ready to dub the game a ten. Yes, there is a but. Actually, a couple of them. These became apparent after a few more plays. First of all, there is a big advantage to going first. The game tries to offset this by giving the trailing players slightly more money, but, in my opinion, it’s not enough. I played one game where I was the start player and got so much of an advantage that it was obvious by the second round that I was easily going to win. Not good. Secondly, money is tight in this game, and whoever gets to sell their wine first can block other players from doing it (I’m oversimplifying here, but that’s the basic idea). This can stymie the other players (and gives even more of an advantage to the start player). Thirdly, the beginning of the game feels too scripted. There are some obvious first moves, and I think it deters from a game when the first few moves are too straightforward. I was musing about these shortcomings on Facebook when I got a note from Jennifer Schlickbernd, who had expressed these same concerns on a thread on BoardGameGeek. The discussion there is quite extensive, and includes the designer plus some players who both refute some of the concerns and suggest some fixes. So, after all that, what’s the conclusion? Well, I think that, in most respects, the game is excellent. It has all the hallmarks of a great game. Unfortunately, for me, the aforementioned issues do need to be addressed. If they are, I can see Vinhos becoming one of my favorite games. Andrea “Liga” Ligabue: (few plays) It is really nice to “work” again with Rick, who first introduced me to the gamer community in the early ages of Boardgame News. I agree with him about Vinhos: it is an excellent game, with great graphics and a superb theme but the beginning is quite slow with some obvious first moves. I’m not so sure that the first player advantage is so big but I agree is not easy to play being the last. I really like this game, like last year’s success, Vasco da Gama, and I think What’s Your Game? is a publisher to watch closely. 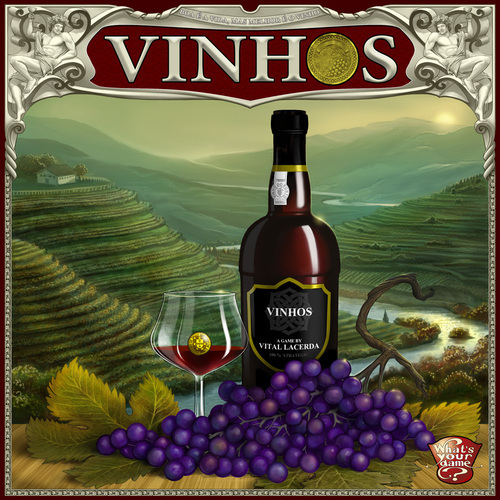 I have not played Vinhos enough times to be sure about its faults, but I really want to play it again and again and I’m also be intrigued about Portuguese wine: both things are for me good signal that the game deserve a chance! Rick isn’t kidding; this is one big game, with lots of rules and a lot of things to take in. The comparison to Die Macher is reasonably appropriate, although I think Vinhos’ complexity is more of the “bunches of detail” variety, while Die Macher’s is more due to some unusual and complicated mechanisms. My one game was full of many trips to the rulebook, a good deal of stumbling around, and finally some appreciation for what the game entailed. It was every bit of 3 hours, but with familiarity, I would think it would come in at around 2.5 hours and a 2 hour game wouldn’t be out of the question. I kind of liked it, definitely want to play it again (if only to try it with more of an understanding of what the hell is going on), and could see it possibly becoming a favorite. Like Rick, I also have a “But…”, but it’s completely different from his and it’s mostly due to design preference. During the entire (very long!) rules explanation and throughout the game, I couldn’t shake the feeling that this was an overdesigned title. It was almost as if the designer threw in everything he could think of and that there was no developer to reign him in. Now I like complex games and if there’s a reason for extra details, I’m all for it. But on the basis of my vast experience of one whole game, it seemed that a skilled developer could lop away, say, 30% of the stuff and still leave a game that was, oh, 95% as deep and skillful. I could be dead wrong about this and maybe all the myriad aspects are necessary for the game to work. But it just didn’t feel like it. It seems as if this is a bit of a trend in heavier games lately and it may come down to what players want to see. I saw it in Dominant Species as well: tons of different actions, each with their own set of rules and lots of other complications. It worked, but it wasn’t at all clear that it wouldn’t work almost as well with only three quarters of those actions. To many players, more may be better, or at least they don’t mind the extra padding if it makes the game slightly better. But to me, it’s not only an impediment to learning and mastering the game, the lack of elegance in the design detracts from my enjoyment. The extra detail in Vinhos didn’t feel flabby so much as overwhelming. With experience, I’m sure I’ll be able to take it all in and take advantage of at least most of the decisions the game has to offer. But one of the reasons I doubt I’ll ever consider this a great game is that it’s just not as tight a design as I think it could be. Hopefully, I’ll have to eat my words and I’ll wind up loving this. I assume the scripting that Rick is talking about is that it’s necessary to build multiple vineyards as opposed to a smaller number of very good ones. We definitely noticed that in our game and the players who took advantage of it did much better than those who didn’t. The extra wine you produce allows you to, indirectly, take more actions, which is vital–some have compared it to the extra family members in Agricola, which seems like a reasonable fit. Right now, it doesn’t bother me, although it might have been nice if a “super vineyard” strategy could work; I’ll just be sure to get a lot of vineyards as soon as I can in my next game. We didn’t know enough for a first-player advantage to show itself, but I’ll keep my eyes open for that in future games. Doug Garrett’s Opinion: (9 plays) – If you listen to our podcast, you will know that this is Shelley and my new favorite game. Eight of our nine plays have been 2-player and I would STRONGLY recommend playing it with two or at most three for your first outing. The game is more forgiving and moves along more quickly with two, and given its 3+ hour length, this is a good starting point. My other recommendation would be to make sure that for your first game you have a ‘good’ year as one of your first two years. Two bad production years in a row can be too painful for new players as the lack of production hurts all that you do. As for Rick’s concerns, I agree that some choices are better than others as the game begins, but I would hesitate to say that it is scripted. Do you want to buy more vineyards as soon as possible? Certainly. Is it the best first move? Maybe for the first player who only pays one extra coin to go there, but there are other choices (experts to employ, a wine cellar to buy, a winery to aid in production, etc.) that are equally valid. The excellent interconnections of possible actions makes this far and away the best wine-themed game out there, and is one that we will be playing often. Along with Web of Power/China this is my only other ‘10’ on the BGG scale. I’ve played Vinhos once and really wanted to like it. The buzz it’s gotten has generally been positive, people whose opinions I respect were on board – what could go wrong? As it turns out, quite a bit. Vinhos was not my style at all, primarily because it felt like an underdesigned title that could have greatly benefited from some ‘tough love’, editor-style. There are some very good ideas in there, but they’re weighted down by so many layers of rules that ultimately the game felt soulless and procedural. First off, the good: The ‘squaredel’, as Rick puts it, is excellent. A wonderful, simple, interactive way of forcing difficult decisions on players, this is probably the best feature of the game. There are lots of things you want to do, but the timing of when you do them and when it costs you extra to do them (because others are there or because it’s far away from the action you are currently on) is clever, forcing you to pay attention to what the other players are doing. Other good things: The components (of which there are many) are very nice. The graphic design is quite good, making it easy to tell what certain areas of the board do for you. – You have to send a wine to the fair. The wine is based on the quality of your grapes, which themselves depend on a bunch of factors. When you turn them into wine, you again apply a bunch of modifiers to eventually give you X, your wine’s quality. – Instead, the initial value you get when you send a wine to the fair has nothing to do with its quality. Instead, you pick one of several spots to place your marker on. Each spot has two colours that correspond to two of the four wine attributes the fairgoers look for. Your wine is scored based on where those colours’ values currently sit. Those values are based on random tiles (that also define that season’s weather and a few other things). Yeesh. And I didn’t even get into the rest of the fiddliness, about how sending wines with certain attributes lets you establish ‘relationships’ with wine experts who give you access to special actions later, or how the spots you put your markers on themselves have special functions, etc. etc. It’s just too much. Another piece of extraneous chrome is the way the game handles money. When you sell wine, you get cash – into your bank account. To get actual cash, you have to spend an action going to the bank and taking it out. While you’re there, you can instead transfer some of your holdings into investments (a kind of track that gives you more or less interest depending on how high up it you are). Okay, so you have to spend an extra turn making your money useful. Fair enough, this is small town Portugal and maybe you need to walk into the bank to handle your business, right? Except that if you need cash on later turns, you can immediately liquidate as many of your investments as you wish for instant cash. So, apparently it takes tremendous effort setting your investments up, but liquidating them is nothing more than a short phone call to the local bank manager or something. It’s nonsensical and adds tedium to the game without really adding any interesting choices – which is my general criterion for stuff in a game that should be ripped out. With about half the extra stuff parsed out, this could have been a truly stellar design. As it stands, though, I’ll have to call it “not for me” and move on. This entry was posted in Reviews and tagged Vinhos, Vital Lacerda, What's Your Game?. Bookmark the permalink. Great review – and I continue to love this site! Played once – quite heavy, but moves along in solid, logical fashion. I found this much more enjoyable and less taxing than the other heavy Euro I played recently, Dominant Species. Looking forwards to exploring further. Quick update – added reviews! Disclaimer: I am a wine drinker so my thoughts about this are colored viewing the game through a glass of wine. That said, of the three recent Wine related games, Vinhos has the most to offer a gamer, but the complexity is not for all players (or winos). The rather large and busy gameboard can be offputting much like a bad aroma from a bottle of wine. But after playing the game, it’s obvious that the the center section is where the game is played and everything else is an extension of the choices made in the center section. Pairing those up is what’s important to playing the game, and that’s where the complexity comes into play. Vinhos is also an investment of time, like laying a bottle down to age. Maturation and appreciation come after the play, not during the game. Despite having only 12 actions for the entire game, the time investment is longer than one might think. Future plays with players who have played at least once, will go faster, of that I am certain. Well Rick, your secret is out! No wonder you’ve crushed us several times, always going first…you cheat! Solid review, I am in no way convinced that it’s short comings are grievous enough to make me feel less about it. I really like it, and would like to play it again almost as much as I would like boardgaming-online to be online, major TTA withdrawals. We should do Vinhos again soon. Nice review. I have played Vinhos three times, its an ambitious design for a début. However, its nor going to see much more play in my house because 1) the game feels too much like a wrestling match with the mechanics, a lot of them seem irritating and pointless in such a richly themed game (going to the bank being top of my list). 2) It’s torture to play with anyone who has not played it before, its so fiddly (fine for me in a 10 game of ‘Here i Stand’, not in a 2 hour Euro) that experienced players end up as constant rule reminder, reference and referee. 2) require that when playing 2-3 tiles, they be in two colors, and 4 tiles be divided 2+2. 2) would create more competition for the best fair locations. Generally, since players just pick whatever tiles they want, they just pick what’s best. There isn’t much jockeying to get the best tiles, or to improve the ones you’re invested in. In contrast, the rule that restricts where in the A/B/C track you may place barrels is more interesting. It sometimes forces you to consider showing a suboptimal wine at the fair in order to get your choice of barrel placement. Vinhos means wines in portuguese! It´s plural! I have just finished playing my first game of Vinhos. I liked it a lot. You say there is a first person advantage, but aren’t their also ways to change player order throughout the game? The money is really tight in this game and makes it really challenging. My brain hurts, but in a good way. Scripted first moves are a common problem (i.e. Stone Age, Puerto Rico), but not a big problem so long as the routes can deviate quickly. Thanks for the review! I will hopefully have one up after a few more goes at it.